When starting out, Mr. Gordon Fawcett just desired to “try and hold back time a little bit”, as growing older had begun to take its toll on his scalp. Effectively, all he wanted was to simply prevent the aging process from further accelerating his hair loss to unimaginable extents & lead to complications. How & Where It All Began? 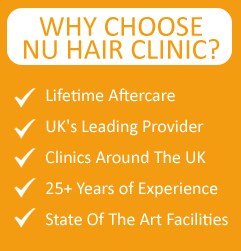 After an initial consultation with 2 specialist doctors at the Nu Hair Clinic in UK, Gordon was given a detailed lowdown as to the entire procedure, including his own expectations and their valuable recommendations. It didn’t take him too long to find out that they both were on the same footing. Mr. Fawcett gives his ‘go-ahead’ for the process to take place, following the confidence & assurance that the expected results would soon manifest themselves. As part of the treatment, he is asked to change his clothes & taken to the minor operation theater at the reputed Nu Hair Clinic facility. Well, it’s not even an year since the surgery and by now the drastic improvement in his self-esteem is plainly evident for Gordon Fawcett to see, thanks predominantly to the rapidly increasing hairline in & around the scalps that were operated upon, which was the underlying aim of the exercise. Reaping the full benefits of the process carried out by several top doctors has had such a huge impact on Mr. Gordon that he has absolutely no qualms in describing the whole package provided at the UK center of Nu Hair Clinic, as “Excellent, I’d really recommend it anything above 10/10, if possible”.